A harvest from Day 4′s closing check out at The Art of Hosting BIG Decisions – While Looking After Self, Others and Place, earlier this month. A harvest from Day 3′s opening check in at The Art of Hosting BIG Decisions – While Looking After Self, Others and Place, this month in Edmonton, Canada. A harvest from Day 2′s check out at The Art of Hosting BIG Decisions – While Looking After Self, Others and Place. A harvest from Day 2′s opening check in at The Art of Hosting BIG Decisions – While Looking After Self, Others and Place. The question that got us started – what do you notice about hosting? A harvest from Day 1’s opening and closing circles at The Art of Hosting BIG Decisions – While Looking After Self, Others and Place. I knew three years ago that a transition was coming for me in April/May 2013. In 2010 I was elected my my professional planner colleagues to serve one year as president-elect, then two as president, for my professional organization – the Alberta Professional Planners Institute. Our AGM was last week and I have officially handed the reins over to our next president. And I have picked up a new set of reins; as past president, I am on the board of the Canadian Institute of Planners for two years. Knowing this transition was coming, I stepped down as president of my community league. The nature of the transition is clear and unclear. I have shed my two “presidential” roles and took on a new board. The other transitions I am less clear on. Two significant pieces of contract work are concluding and I don’t know what will come next to help pay the bills. As I look at my schedule for the coming weeks, I see that I have created space for myself to make a transition of some kind. My antennae are work! Last week, I spent a day with David Whyte, reflecting on my work and where it is going. A big realization came to me: Lost? Let the city find you. On my way to spend a day with a group of women exploring their personal leadership, from the inside to the outside, the ice flows in the river have firmly caught my attention. Just when I think spring’s work is done, when life is flowing freely, a jam I never knew was there releases. I don’t see the jam, just the ice and the debris it carries. 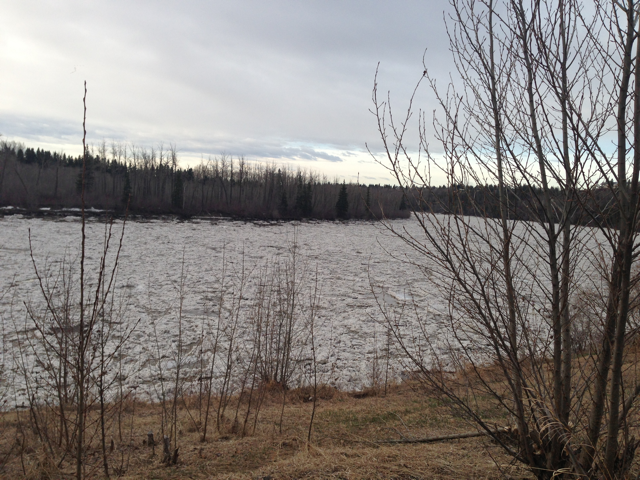 The smooth surface of the river’s spring flow is now a torrent, a rush I only noticed with the ice. There’s some inner work to notice what is flowing in and through me, and how to ride the release safely, or how to boldly grow the self. Today, I have gathered with 40 other circle practitioners to explore our work creating the social containers our world needs at this time. For me, the social habitat is a critical aspect of making cities that serve citizens – and citizens that serve cities. While the gathering is work related, it is equally about my personal social habitat and my approach to myself and my work. My operating principle remains the same: nourish self, others and place. I have no idea what will come next, but I choose to spend time where I feel nourished, where I can nourish others and the places we live, work and play. I choose to nourish my/our social, physical habitats and my/our economic life. This is ultimately what will enable me to ride the river, and whatever she throws at me. What ideas and practices support you in your life’s journey?